Page permissions have been simplified and reduced to three different access levels: no access, view, or edit. Other permission settings related to form record access have been moved into the form widgets, and additional options have been added. 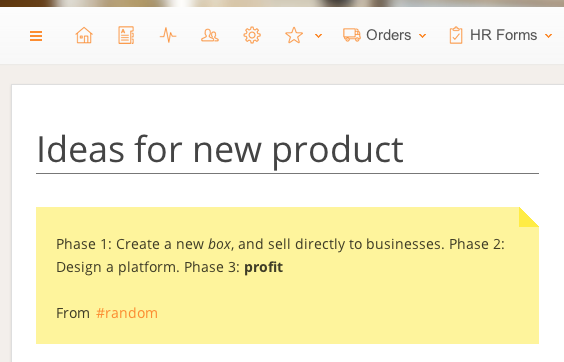 We redesigned the dialog used to create new pages (or change settings of existing pages). It’s faster to load, hides options you usually don’t need, and makes it easier to select who has access. It also works much better in accounts with hundreds of users. Creates pages should be much simpler and faster now. Before today’s update, people were member of one group. In many cases though people needed to be part of different groups, like Paris Office and Sales, or Houston HQ and R&D. You can now (re)assign people to multiple groups from the People Directory (click on a user and select Set Groups). 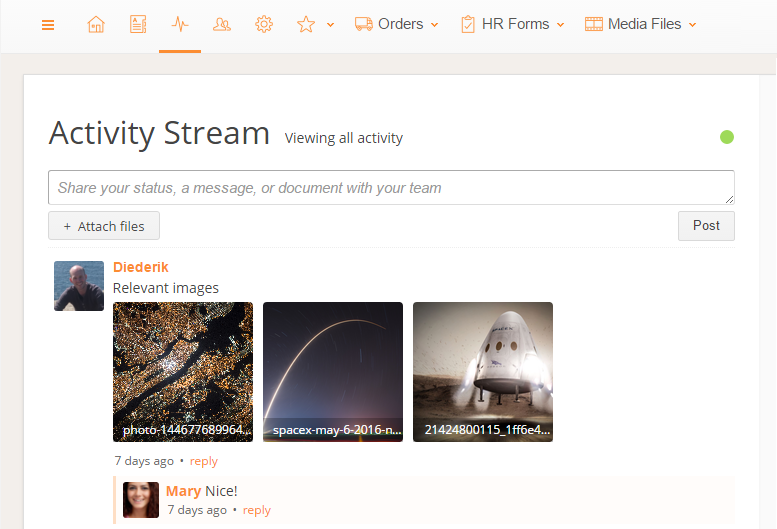 Assigning people to multiple groups makes it easier to browse people in the directory, assign permissions, or have conversations with groups of people on the Activity Stream. The Create new Page dialog now also includes an option to select an existing template. 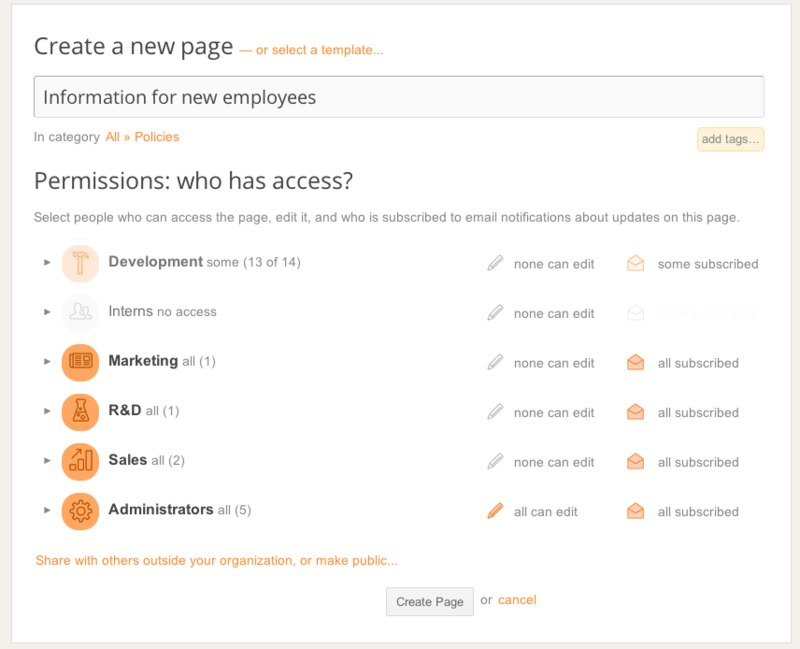 When selecting a template, the new page will start out with the same permissions and content as the template page. This is similar to how the Copy Page feature works, but now makes this option available in a logical place: the dialog when creating a page. Pages can be made available as a template from the Page > Page Settings dialog. The new features are now available to all new accounts. Unlike most new features though, these updates are not automatically enabled for existing accounts, as they might change existing permissions. Instead, we can manually enable these new features for your account by request. This entry was posted in General on November 8, 2016 by wim. Just a quick Monday-morning update. 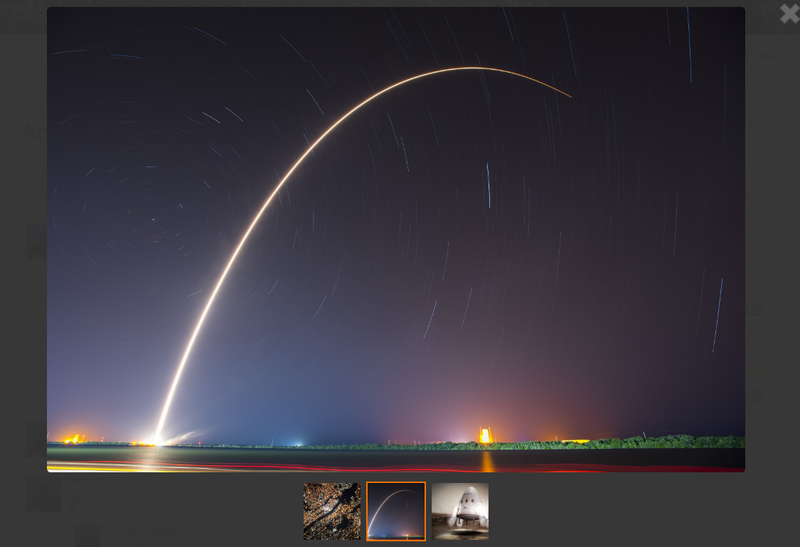 If you click on image thumbnails on the activity stream you’ll now get an Image Gallery. The image gallery is touch-enabled and works on mobile devices. You can still download images by clicking on the filename at the bottom of each image or by right-clicking and choosing “save link as”. If you add a mix of documents and images as attachments to a comment, only the images will appear in the gallery, the other files will be available for download as before. This entry was posted in General on September 26, 2016 by Diederik. 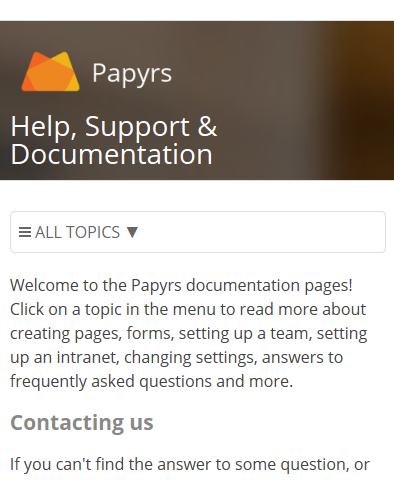 Already using Slack, and want to use Papyrs as a wiki/intranet site for your Slack team? With the Papyrs for Slack app you can easily search your (wiki) pages and post new notes right from Slack using the /papyrs command. 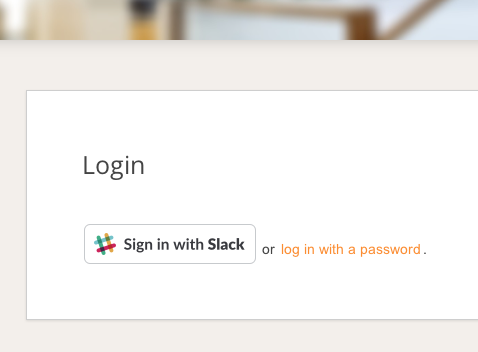 You’ll also be able to use Single Sign On and log in to Papyrs directly with your Slack account. Read more at Papyrs – A Wiki for Slack. This entry was posted in General on September 23, 2016 by wim. 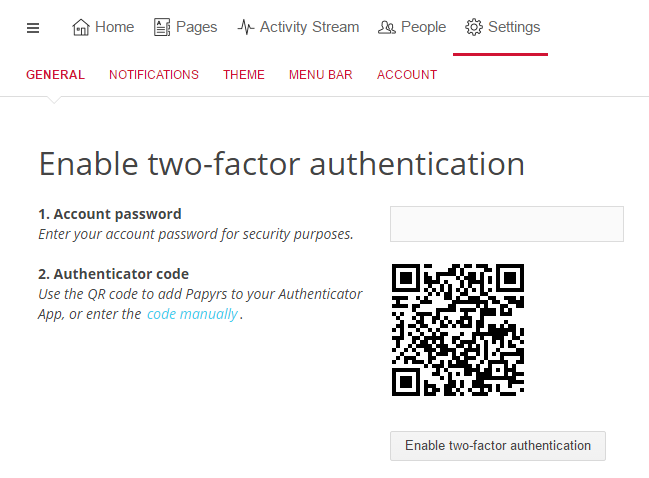 Today we introduced two-factor authentication which you can enable for extra security. With two-factor authentication two different things (factors) are required to log in: something you know (your password) and something you have (your phone). So when two-factor authentication is enabled you can no longer log in just by entering your password, you will also need to enter a time-based security code from your phone. Papyrs uses Time based One Time Password (TOTP). 1. Go to Settings > General. 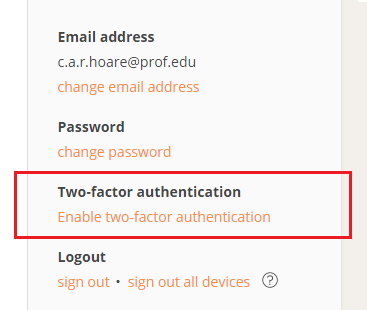 Then Select “Enable two-factor authentication”. 2. Enter your password and scan the QR code in your OTP smartphone App. 3. Enter your OTP security code from your smartphone app. 4. Success! Two-factor authentication is now enabled. That’s it for this update. More coming soon! This entry was posted in General on August 24, 2016 by Diederik. By building forms on your intranet pages you can collect all kinds of information and process requests. One of the available form widgets is the Choice widget. This allows visitors of the page to select one or more options, depending on the type of input you choose. The Choice widget supported a select dropdown, checkboxes and radio buttons. We’ve now added support for an auto-complete combobox field. This is especially useful if you have many options which users can choose from. A list of checkboxes quickly gets unwieldy when you have more than twenty options or so to choose from. With the new auto-complete field, people can just type in one or more options they want to select. We’re working on making Papyrs more accessible from mobile devices, and we’ll have more news on that soon. For now we’ve already updated the documentation site, which now uses a responsive design for mobile devices. For developers who want to integrate Papyrs with existing systems, we also have some additional functionality. First of all, the API now supports two new methods: retrieving a list of people from the People Directory, and updating existing Text widgets on a page. You can find the updated documentation at http://papyrs.com/docs/api/. Papyrs also offers Single Sign On integration with Google Apps and Windows networks (LDAP/Active Directory). In addition to that, we now allow developers to use Papyrs as an identity provider to other 3rd party apps. As an intranet site, Papyrs is often a logical starting place for people to start looking for all kinds of information. When other applications are integrated with Papyrs, people can now simply access those connected systems after logging in to Papyrs. The technical details for using Papyrs as SSO provider can be found at http://papyrs.com/docs/single-sign-on/. This entry was posted in General on February 20, 2015 by wim.